The night’s darkness persists on at dawn. A dense cloud hovers over Wakiso district and the surroundings. Soon, the tropical skies let loose their waters. The rains pond the green grasses of Jolly-Mercy Learning Center’s compound and newly formed streams run off. A rain water harvesting tank is collecting its share from the roof. Students walk around the verandahs heading to their respective classrooms. But only a handful of the teachers have made it in time to the start of the day’s lessons. Most of the teachers stay a distance away from the school. The rains started before most of them had arrived and now the roads are impassable. Students seem to enjoy the teachers’ absence, as children do, as they play and crack jokes in their classes. Some noises are overheard over the rains pattering the roof. This is one of the challenges that JMLC is facing – trying to get teachers and students to spend effective time together and complete the syllabus in time. But a solution has been found. CALM Africa was started with the pressing aim of promotion, observance and protection of the rights of vulnerable children. One of the channels used to achieve this mandate is to provide quality and accessible education to these children. “Already, CALM Africa is sponsoring over 80 orphans and disadvantaged children at our Jolly-Mercy Learning Center”, explains James Ssekiwanuka, the Director of CALM Africa. One of the challenges that JMLC has faced is to attract and retain professional and experienced teachers, against competition from long established primary schools. A means of securing quality education for the children, CALM Africa provides living accommodation for the JMLC teachers, in a rented property some distance from the school. As a result of that morning downpour, teaching sessions have been missed. With four weeks remaining to sit end of academic year examinations, this will affect the quality of education; teachers fail to finish the syllabus and students miss out. To address the welfare of teachers and boost their teaching morale, CALM Africa secured a 6-acre piece of land just a few meters from the school compound. 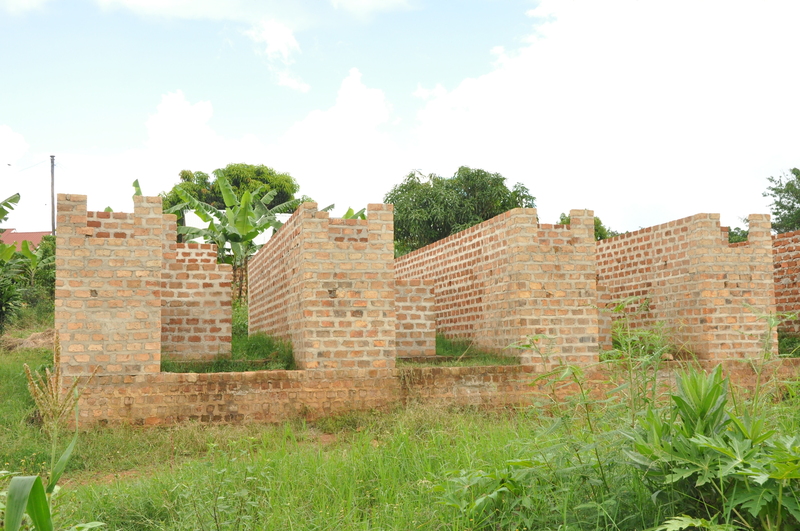 On a part of this piece of land, CALM Africa has already established a foundation and built walls up to the mid-window level, for a total of 16 rooms to accommodate the teachers. “With the help of volunteers, we cleared the site and started construction in mid-march this year. Our plan was to finish the construction as fast as structurally possible. 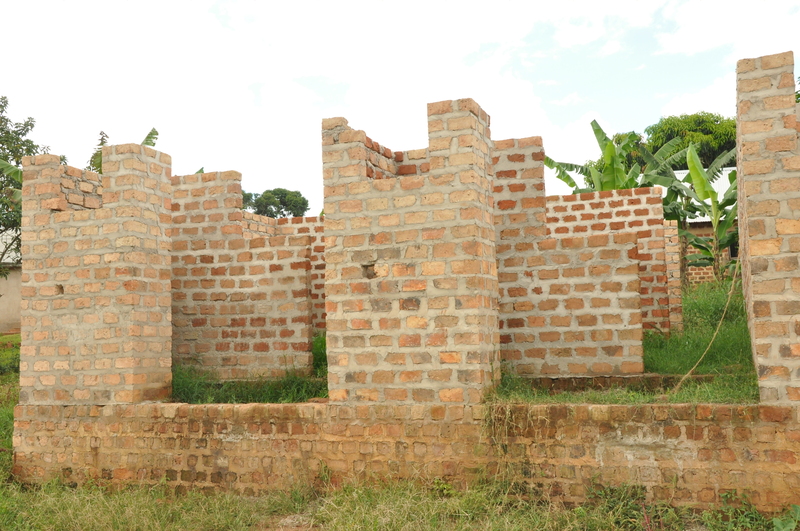 But with limited funds, the building is still under construction and we have failed to complete it,” explains James. “If we secured funds, according to our engineer’s projections, we can finish the remaining construction phases in one month, and the earlier we finish it the better” he explains. 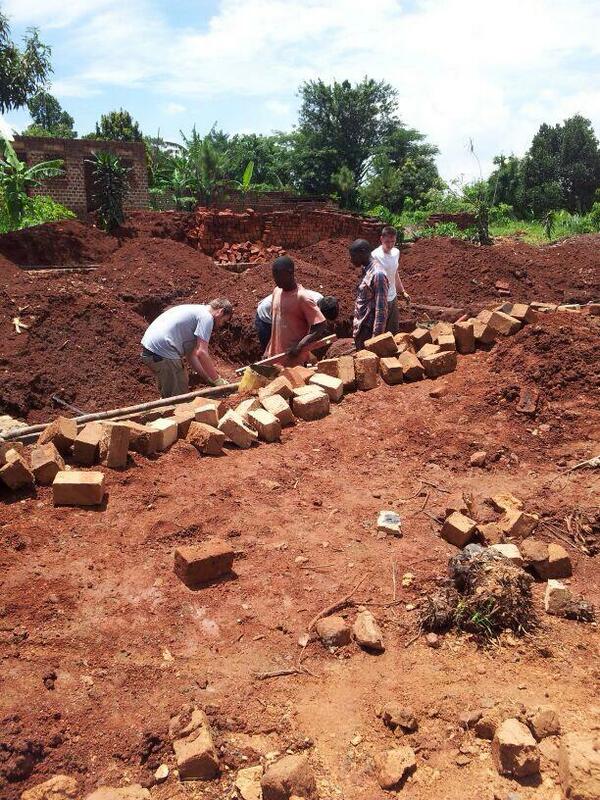 “We are in need of financial support of £6000 to finally complete our teachers’ house. With this money, we will finish the next two main phases: final construction of the walls and roofing. With that finished, all that will be remaining will be to add in shutters and do final construction touches,” as James gives the expenditure plan. Once completed, the 16-rooms will house 8 teachers, with each teacher having 2 comfortable living rooms. By establishing teachers’ quarters within the school surrounding, this will have a significant, sustainable impact. The teachers will have more time to focus on and interact with the students; the school will save money in the longer-term. “At the moment we spend over 10 million Uganda shillings per year on teachers’ rent payments. With the saved money, we will right away start on constructing another block of teachers’ quarters because our plan is to have all the teachers within the school environment. Land is already there, we are seeking assistance to help us begin setting up the houses,” James adds, leaking the plan ahead. During holidays, some teachers stay within the community to identify vulnerable children in need of support, mentor students and engage the community and leaders in child protection and child rights advocacy. If the teachers can live within the vicinity, this will boost their morale and make them more result-oriented. Contributors to this project will be directly supporting CALM Africa in its mandate of promoting the observance and protection of the rights of vulnerable children. And will indirectly be empowering vulnerable children to have access life enhancing skills, rights awareness and quality education. Please feel free to email fundraising@childrenfirstuganda.co.uk should you have any more questions or ideas about this campaign. Thank you.